This is reported by Raion.Lutsk media outlet. 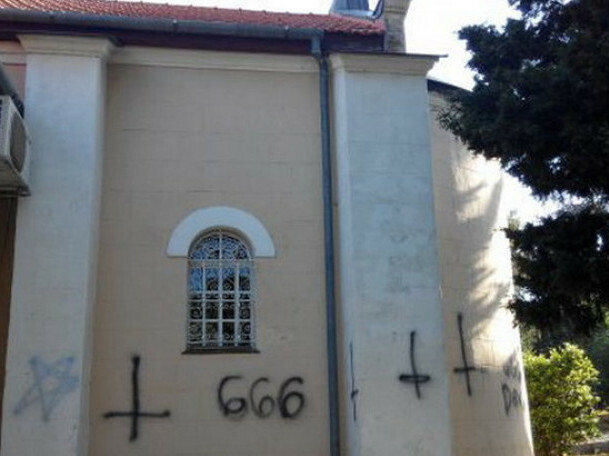 In the beginning of March, at night, unknown offenders painted the walls of the church with satanic signs and statements inciting hatred. Within the framework of the criminal proceedings instituted, the security officers documented that a resident of Lutsk received an offer through one of the social messengers from an unknown account to defile the church of the Orthodox Church of Ukraine in the regional capital. The customer introduced himself as a citizen of the Russian Federation and offered a monetary reward for the offence. The resident of Lutsk agreed to perform the order, having also involved an acquaintance of his from Rivne. The young men waited for the night to come and painted the walls of the church in accordance with the instructions given and then disappeared from the crime scene. The attackers were supposed to send to the Russian a photo report to get paid. According to the intelligence service, the customer planned to use the photo before the presidential elections to illustrate the alleged instability of the church and socio-political situation in Ukraine and the inability of the Ukrainian authorities to secure order in the country. Within the framework of criminal proceedings, the perpetrators will be served the suspicion of committing an offense under Article 179 of the Criminal Code of Ukraine. Pre-trial investigation is ongoing.